I’m wishy washy about improv class showcases. But on the other, nothing informs an improviser like improvising and all it entails – collaborating to build something out of nothing in-the-moment before a live audience. And so practice in front of a live audience should be part of each course. So the in-between place becomes preparing each class for a performance that showcases – in grand improv style – all that they learned in class, on top of everything they’ve learned before, within bounds that keep them from stumbling into unknown territory. A Coalition show called Strange Bedfellows pairs an actor with one half of a script with an improviser who ad libs their half. I had the honor of performing one night in the improviser’s role. And I have never been more terrified pre-show. In a typical show, I have at least one improv partner. I can relax in the uncertainty of improvisation knowing that, whatever happens, my partner(s) will support my choices, I’ll support theirs and any direction we go together will be successful. In this show, I can’t trust my scene partner to support my choices; they’re tied to their lines. They could be directly working against me. Other improvisers who had done the show encouraged me to “just make a choice.” But “a choice” can be anything: a limp, a pirate accent, a yo-yo. My anxiety wasn’t calmed by the advice. My calm came from realizing that I didn’t need to treat this any different than any other scene. And to succeed in any scene all I had to do was Feel and React. Mikael Johnson, Jason Saenz and I are Best Friends. And our Best Friends format is one of my favorite. This show was the only show we taped. And while it isn’t our best, it’ll suffice to document our Slideshow Opening and our Three Character Format. When building Group Games, trust simplicity as The Coalition’s Big Bosses did in this To The Ether game. Why? When a pattern is this clearly established and heightened you can reach the point where you don’t even need to finish the sequence before the audience is laughing uproariously, having completed the pattern in their own head. To establish sustainable scenes, it is helpful to remember that each player on stage can have at least one Personal and Scenic game at their disposal to heighten. The games represent a pattern of behavior established through evolving rules. 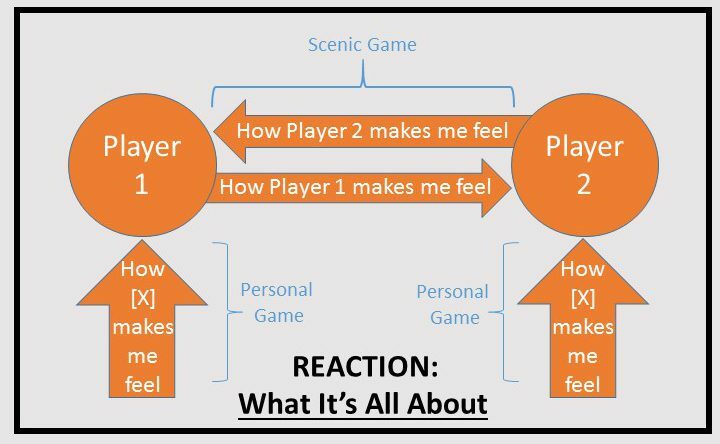 Establishing and leveraging these games A) enable players to react through rather than think through scenes and B) engage the audience, letting them know our characters through their patterns of emotional behavior and care about them. The embedded clip is an Organic Opening from a Harold. They engage the environment and make interesting stage pictures. They leverage verbal patterns of call and response. And they follow each other. Want to learn more about the why and how of Openings in long form improvisation? CLICK HERE. As said best in Truth in Comedy, “The Harold is like the space shuttle, incorporating all of the developments and discoveries that have gone before it into one new, superior design.” The other way around, Harold’s learnings pack in the lion’s share of what you need to know to do any other long-form, which is why The Coalition teaches students long-form improvisation formats through the lens of The Harold first. To provide students with an example Harold (Richmond is not, after all, Chicago, New York or Los Angeles where an improviser can see a Harold every night of the week), some of The Coalition’s most experienced players came together to perform the show embedded below. For a group that had never before all done a Harold together, it’s pretty good. Lights were pulled before we could get to the 3C scene, but several of us had one ready. That’s why improv is a great hobby for people who like to sit around in bars and talk about what they could’ve done. Blackouts are fun. They can help vary the pacing of a long-form show. They can be great when it’s clear there’s not going to be a bigger laugh beyond the first big punchline, but even if there is life beyond the punchline it can be enjoyable to cut the scene “early” so you can bring it back later. Will Hines and I had a scene where, in crossing stage, he asked if I had “a roll of quarters in my pants.” I did, I removed it and that was the end of the scene. Later in the show he asked if I was smuggling a zucchini in my pants; again, I was. Repeat. I really love this Blackout from Horse Apples’ District Indie Improv Fest Show. Joey Tran kills it by being authentic. Truth is he doesn’t believe he can whistle; that’s honest frustration in his “no” to my question. And the audience believes him. So when he tries – and he legitimately tries because, again, he doesn’t think he can – and, lo and behold, he succeeds!, the surprise is also genuine. Honest, in-the-moment, shared with an engaged audience, emotionally reactive… that’s improv as improv does best, folks. This is a fun show. Lots of support. Big group games. Many recurring patterns through the show. Invested characters. Accepted endowments. And some authentic Improv As Improv Does Best moments. Thank you, District Indie Improv Festival for having us and recording this show! I love improv and believe (when my heart and head are in it) that I’m good at it, too. Here are some other things I love and believe myself to be good at. They share some skills with improvisation. Am I good at improv because I am good at these things, or am I good at these things because I’m good at improv? Doesn’t matter; who cares. What’s fun is thinking about how the skills involved in these activities translate into being good at improv. Enjoy!